I love West Virginia, but her mountains don’t like me. Knowing that this round of vertical climbs is preparation for bigger climbs in the Rockies, challenges me to be a bit more fit when that moment arrives. The nearly fifty miles I rode today was almost a pleasure, helped by the clouds and the temperature in the low 70s. We arrived in Parkersburg to meet with Judi Ball, Executive Director of the West Virginia Coalition Against Domestic Violence in Parkersburg. She pulled out all the stops for our visit to her hometown. 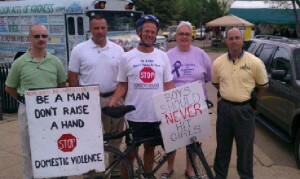 She had her entire staff, the Chief of Police, a couple of detectives and the press waiting for The Kindness Bicycle Tour when it pulled into the downtown area of Parkersburg. It is a great feeling and honor than to arrive for a short speech and have a crowd politely waiting. Thank you to everyone who showed up for my visit and made me feel welcome in Parkersburg, including the special parking privileges provided by the Chief. Yesterday, John Joe Madia gave me 2 plush bears for the first 2 children I found who could use them. It took less than a day to find those bears a home, as all of the shelter advocates at the WVCADV agreed that they knew many children who could provide love to the bears. 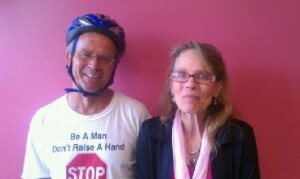 Alicia from Legal Aid stopped by to meet The Kindness Bicycle Tour. She helps victims during a very emotional and stressful time, find the attorney suited for their particular case. While riding today, Deborah flagged us down and bravely told us of her years of abuse and how Domestic Violence has affected her family for generations. 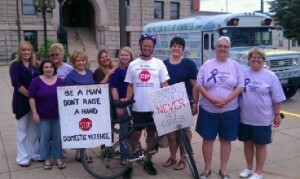 Deborah has hopefully broken the cycle in her family and her own life by being a victim’s advocate for several years. If true, her tragic story will have a bright ending. This entry was posted on Friday, June 24th, 2011 at 8:32 am	and is filed under Kindness. You can follow any responses to this entry through the RSS 2.0 feed. You can leave a response, or trackback from your own site.